Mohin Sajib, a student in the College of Veterinary Medicine’s Biomedical Sciences graduate program, and his professor, Dr. Bruce Smith. Abdul Mohin Sajib, a student in the College of Veterinary Medicine’s Biomedical Sciences graduate program, is a 2017 recipient of Auburn University’s Outstanding International Graduate Student Award. 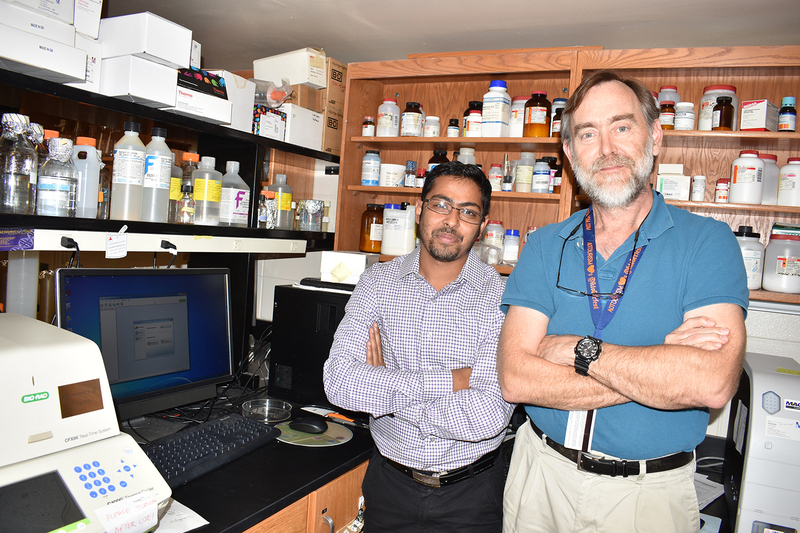 Sajib is mentored by Dr. Bruce Smith, a professor in the Department of Pathobiology and director of the Auburn University Research Initiative in Cancer (AURIC). He has worked with Dr. Smith in the laboratory setting for four years as he completes his doctorate degree in Biomedical Sciences. Recombinant DNA technology is widely used in biotechnology, medicine and research, Dr. Smith explains. Recombinant DNA (rDNA) molecules are DNA molecules formed by laboratory methods such as molecular cloning, to bring together genetic material from multiple sources, creating sequences that would not otherwise be found in the genome. Sajib has completed most of his doctoral work – including co-authoring a significant peer-reviewed paper about his research in Recombinant DNA and cancer studies – and now is putting the pieces together with a graduation target of next summer. A native of Bangladesh, Sajib holds a master of sciences degree in genetic engineering and biotechnology from Shahjalal University of Science and Technology (SUST). Founded by the Government of Bangladesh in 1986, SUST is the first university in that country to adopt the credit system used in the United States and is one of 16 Ph.D.-granting universities in Bangladesh. Sajib says he was drawn to Auburn because of colleagues who already were studying here.